Bristol fly-half Matthew Morgan is to leave the club at the end of the season after two years. 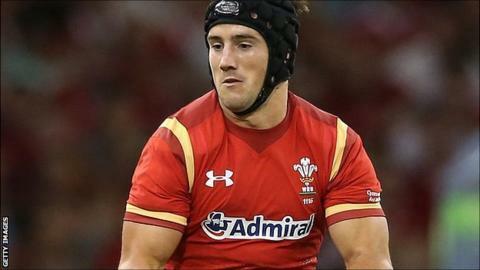 Welshman Morgan has been linked with a move to Cardiff Blues and has told Bristol he wishes to improve his chances of international selection. The 23-year-old started the World Cup pool match against Fiji and has five caps for his country. "We're disappointed to lose a player of Matthew's quality," said Bristol director of rugby Andy Robinson. Morgan has made 26 appearances for Bristol, scoring 167 points, and was named the Championship player of the year following an impressive debut season. "I'm desperate to represent my country and leaving Bristol is the best opportunity for me to achieve this goal," he said. "My time at the club has been fantastic and I have a great relationship with my team-mates and the supporters." Morgan made his international debut against South Africa in Durban in June 2014. His four appearances for Wales since then have all been at the Millennium Stadium. Blues have declined to comment, but Robinson said he understood Morgan's reasons for wanting to depart. "We can't fault a young man in wanting to play international rugby," he added. "I just hope that those giving Matthew advice stick to the promises that have been made to him. These are the main factors behind his decision to leave. "Matthew has lit up Ashton Gate with his performances. He's grown into a confident player who has had the opportunity to represent his country at a World Cup. "We back Matthew in his decision and he will leave with our best wishes at the end of the campaign. Until then, he knows he has a job to do and will be focused on signing off in the best possible way."